The present town was founded by German settlers, however it was built upon a former Slavic settlement. The copper mining town acquired its present picturesque look in the Late Middle Ages when the prosperous burghers built its central churches, mansions, and fortifications. As a historical city with an easy access to the surrounding mountains, Banská Bystrica is a popular winter and summer tourist destination. Banská Stiavnica, magnificent small mining town on the top of a hill is a completely preserved medieval town. Because of their historical value, the town and its surroundings were proclaimed by the UNESCO to be a World Heritage Site in 1993. 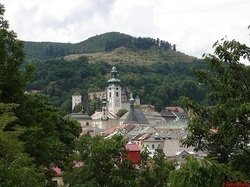 You can visit its castles, the mining museum, lakes and nearby spa Sklene Teplice. Third of the three famous mining town in central Slovakia. The well-preserved medieval town built above important gold mines is the site of the oldest still-working mint in the world.